When Peter Harding Construction began work at St Wilfred's Academy, Blackburn they were presented with bad ground conditions, which needed a drainage solution that would enable them to complete the works with maximum efficiency whilst ensuring the health and safety of every member of their team. Having appraised the drawings, the drainage consultants designed orifice chambers and Hydro-Brake chambers within the surface water network using traditional site based construction methods. However following several meetings and discussions in relation to an off-site design and also reviewing the cost implications and other design options, BPDA member CPM Group presented a full package of sealed 1200mm & 1500mm Perfect Manholes and offsite solutions for orifice and Hydro-Brake chambers. The offsite proposal enabled changes to the cover levels to be achieved that overcame an original concern with the overflow on the Hydro-Brake chamber. The design used the Perfect Manhole system where possible but due to the unusual "S" style channel configuration in a constricted area it was not always ideal. An alternative proposal to use a 1500mm sealed Catchpit using an offset inlet and outlet with a cast in-situ configuration was deemed the best option. As well as evaluating the options for the access chamber design, a full appraisal of the pipeline design was undertaken and optimised pipe sizes presented to the client using precast concrete pipes, which provided durability benefits during and after construction as well as installation savings using a lower cost pipe bedding option. 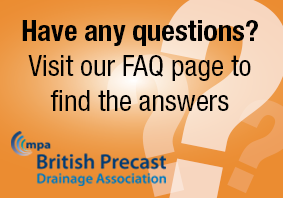 The option to use a plastic pipe with full granular surround (Class S Bedding) was considered. However, the precast concrete pipe option enabled Class N Bedding to be used which meant reduced use of imported aggregate leading to cost savings and lower environmental impact. Having approved CPM's Perfect Manhole System and Offsite Solutions proposal, Ray Harding of Peter Harding Construction stated that "The overall solution not only accelerates the installation of the drainage requirements, it also allows for the installation of the drainage in poor ground conditions, faster, easier and more economically than traditional build".